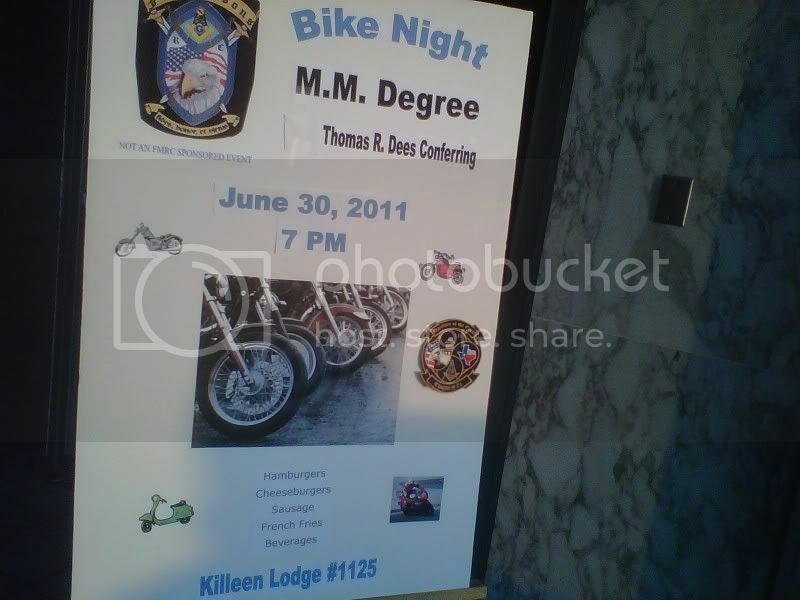 Discussion in 'Upcoming Masonic Events' started by nwendele, Jun 28, 2011.
congrads brother, looks like a good time! Thanks! Hard to get any work done today. i know the feeling just being raised mon,wish we could of had a bike night,geees lucky what type of bike do you have? 2006 VRSCR Street Rod. I like all types of bikes, and work for a dealership, but my V-rod fits my riding style. What are you riding? Nearly every officer in our lodge rides. Pretty cool. Had 12 bikes or more there last night. i used to ride a beefed up xl883c, i want a nother bike but i almost killed myself on the last one. was in a coma for a week and almost parished, i like to go way to fast, its just cages now brother. Wow, sorry to hear you had to go through that experience. i learned a lesson in whats important in life and how fragile it is, i have nothn but love for the motorcycling community. just please,please wear a helmet brothers, i was wearing an awsome helmet and still got put in a coma. imagine what my head would have looked like if i hadnt worn one. thats my piece. I agree it should be a choice, but I wear a full face and jacket 100% of the time! Been working around it too long, lost too many friends that didn't need to go yet. Tried to ride without my lid on a perfect day about 4 years ago, felt so naked I turned around after a few miles. Never will do it again. yah when i do ride its with a full face, when i had my accident i was wearing a dot approvied half helmet. i didnt wear my jacket but, i didnt get hardly any roadrash, i was wearing gloves thank god,or my hands would have been hamburger.